CALGARY – For one more week, the Vancouver Canucks and their fans can hold to the notion that results don’t matter at this time of year. And it’s absolutely true. But now more than halfway through the team’s seven-game National Hockey League preseason schedule, trends have emerged that will likely carry over into the games that count starting on October 3rd. Saturday in Calgary, the Canucks fell 5-2 to the Flames. It was the club’s third loss in four preseason outings. But again, there are no standings points up for grabs right now, so the outcome isn’t the important part of the equation. It’s how the Canucks arrived at the end result. 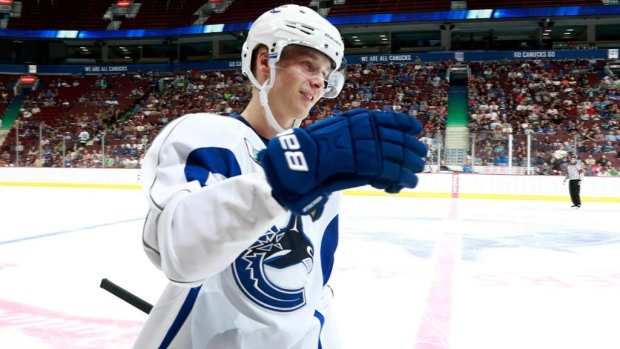 And as has been the case through the first week of the preseason, the team is being carried by a potent power play featuring highly-touted rookie Elias Pettersson. The young Swede scored his first goal on NHL ice Saturday on a first period two-man advantage and later set up Brandon Sutter for a redirect past Flames netminder David Rittich on a third period power play. The game marked the second straight two-point performance for Pettersson who also picked up an assist in his NHL preseason debut last Tuesday. Through three exhibition appearances, Pettersson has racked up five points – all on the power play. As a team, the Canucks have struck five times with the man-advantage, so it’s evident that Pettersson is having an immediate impact on special teams. That has to been seen as a positive for an organization turning the page from the Sedin era that Pettersson has arrived on the scene and has already become a fixture on a power play that is picking up where last year’s left off. The flip side of that, of course, is that the Canucks have generated next to nothing at even strength through their first four games of preseason play. The team, which finished 29th in the NHL in 5-on-5 goal production last season (138 goals in 82 games or an average of 1.68/game), is off to a rocky start in exhibition action. The Canucks have struck just three times at evens so far: Sven Baertschi’s between the legs goal against Edmonton last Tuesday, Brendan Leipsic’s individual effort against Calgary a night later and Bo Horvat’s partial breakaway versus the Los Angeles Kings on Thursday. At even-strength so far in the preseason, the Canucks have been outscored 12-3. With numbers like that, there is a long list of players who have yet to do their part including an entire defense corps which has been challenged to up its offensive contributions but hasn’t been able to make a mark on the scoresheet. The Canucks have actually outshot their opponents at evens 91-87, but the team’s 3.2 per cent E/S shooting percentage has to be an area of concern. Brock Boeser scored 19 even-strength goals last season and will surely find his range again – he had four shots on goal and 12 attempts Saturday in Calgary. However, after Boeser, Daniel Sedin (14) and Thomas Vanek (13) were next in line in goal scoring at evens. Among returning players, Bo Horvat and Brandon Sutter (11 apiece) and Jake Virtanen (10) were the only others to reach double-digits. The way this team is constructed, it certainly seems like even-strength offense will again be an issue even with the addition of Pettersson. The Canucks cashed in 53 times last season with the man-advantage. The two seasons before that they failed to reach 40. So if the team is unable to match its power play production from a season ago – and that was with the Sedins – it’s going to place a premium on even-strength scoring. A healthy Bo Horvat should be able to boost his contributions, Sven Baerstchi is getting paid to produce and after that, the Canucks will be leaning on players like Pettersson, Brendan Leipsic, Nikolay Goldobin and hoping for a surprise surge from a few of their bottom six forwards. There are still three preseason games remaining for the Canucks to figure things out. But don’t fool yourself, when it comes to even-strength offence there are certainly warning signs that can’t be ignored.